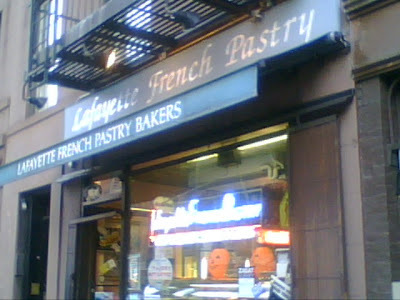 I'd noticed recently that Greenwich Village's Lafayette French Pastry looked closed, but I thought perhaps the owners were on summer vacation. I learned today from Eater that the longstanding baker had shuttered for good. Taking over the space will be the irrepressible New York culinary world loudmouth Michael Bao. This was actually Lafayette's second location in the Village. It used to be on Bleecker Street near Seventh Avenue. It moved about 15 years ago, replaced by a Burritoville which has since vanished. In that guise, it epitomized, for me, the Greenwich Village small business, full of effortless local character. Lafayette was around 85 years old, run by three generations of the same family, a real relic of the old Village. According to their Facebook page, the owners got a letter of eviction in June. The comment seems overwrought, but what has been happening in New York is really colonization -more powerful outsiders coming in and forcing the locals to leave and/ or change their culture. Its a shame because it was actually a pretty good culture as these things go. I wish there had been more resistance. Ed: There has been resistance. But it's hard to fight City Hall, and City Hall's the one that wants the city colonized by large outside forces. Lost City Asks "Who Goes to Donovan's Pub"? Lost City Asks "Who Goes to Roll-N-Roaster?"